+2 Strength, +2 Constitution: Gnolls are a strong and hearty people. Medium: Gnolls have no bonuses or penalties based on size. 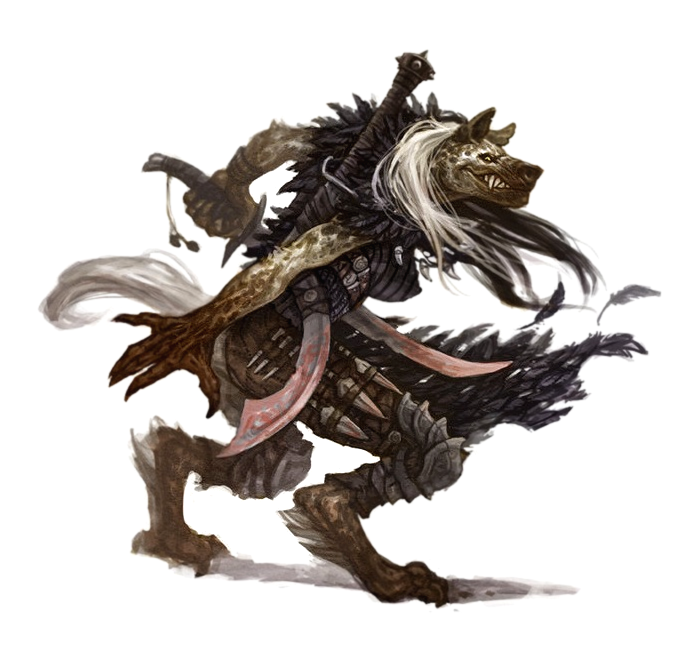 Natural Armor: Gnoll hides are remarkably tough, giving them a +2 bonus to Natural Armor. Darkvision: Gnolls have Darkvision 60'. Scavenger: Gnolls gain a +2 Racial bonus on Appraise and Perception checks, furthermore they can identify potions by taste. Powerful Jaws: Gnolls can use their bite as a natural weapon, dealing 1d6 + STR damage. Furthermore, they gain a +2 bonus to CMB checks to grapple foes as long as they are able to use their jaws as well as their hands. Languages: Gnolls begin play speaking Gnoll. Gnolls with high intelligence scores may choose bonus languages from the following list: Common, Waesa, Sylvan, Elven, Abyssal and Dwarven.